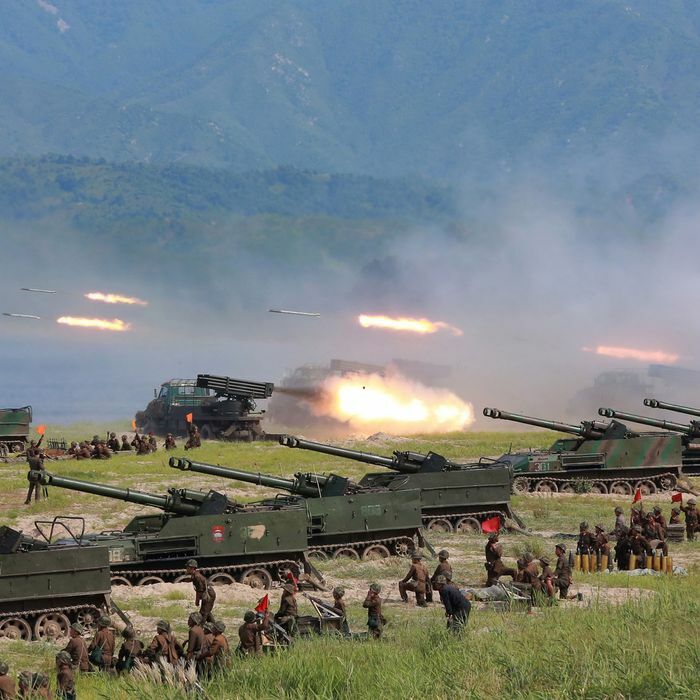 The Korean People’s Army launches rockets during a target-strike exercise in an undated photo released by North Korea on August 26, 2017. The crisis in the Korean Peninsula continues to escalate in the wake of provocative ballistic-missile tests by North Korea. On Thursday, U.S. and South Korean jets — including four American F-35 stealth fighters, two B-1 bombers, and four South Korean F-15 fighters — carried out a joint exercise in a show of force that U.S. and South Korean military officials said was in response to those provocations. The U.S. bombers launched from Guam, which North Korea has been cryptically threatening to attack, while the stealth fighters took off from a U.S. Marine Corps base in Japan, which the isolated nation had overshot with a long-range ballistic missile on Monday, days after reportedly testing three shorter-range missiles, one of which failed to launch. Thursday’s exercise, held over the Pilsung training range in South Korea’s eastern Gangwon Province, simulated a surgical strike on enemy facilities. The inclusion of the F-35s was significant as these next-generation stealth fighters would play an integral role in a preemptive strike on North Korea if the situation were to deteriorate into active war. This week’s ballistic-missile tests were themselves a predictable response to the regularly scheduled, large-scale joint military exercises Washington and Seoul have been conducting over the past two weeks; the North Korean regime sees these as rehearsals of an invasion and routinely responds to them with bellicose gestures. Indeed, the power to halt these exercises appears to be the main lever we have available to influence North Korea’s behavior, but neither the Trump administration nor the South Korean government is eager to offer them up for negotiation. This week’s escalations fit an all-too-familiar pattern of Korean-American exercises provoking North Korean missile launches that in turn prompt U.S. flyovers of the peninsula and more threats from Pyongyang. At this point, however, the North Korean regime has clearly signaled that it is unmoved by American shows of force, because it knows that the costs of an actual war are unacceptable to the U.S. and its allies. The only thing that can possibly come from this saber-rattling involves hundreds of thousands of dead Koreans on both sides of the demilitarized zone. De-escalating the tensions is a prerequisite for any kind of meaningful diplomatic breakthrough, but it’s not clear that the U.S. is interested in either de-escalation or diplomacy at this time. Part of what makes the current situation uniquely volatile is that the communications coming from the White House are completely unpredictable and beyond the control of anyone other than Trump himself. Every time the president tweets, as he did on Wednesday, that “talking is not the answer” to North Korea, there is a chance that Kim will interpret Trump’s bluster as an actual shift in U.S. policy from jaw-jaw to war-war. That Secretary of Defense Jim Mattis has to deny rumors that he and the president disagree on how to approach North Korea is a suggestive sign that there is some daylight between the White House and the Pentagon on this matter. Even if these differences are not about policy but rather about how to communicate policy, as some observers suggest, in this case, such a difference is significant in itself. After all, Mattis likely understands much better than the president the dangers of promulgating a foreign-policy doctrine 140 shouty characters at a time.